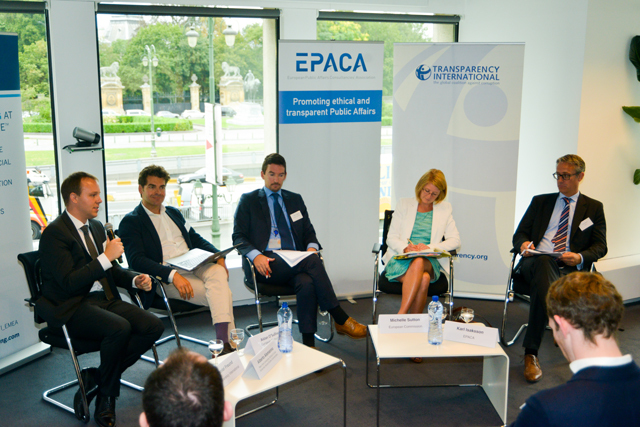 Brussels, 6 September 2016 – On 6 September, the European Public Affairs Consultancies’ Association (EPACA) and Transparency International hosted a joint event – Transparency, Accountability and Integrity in the EU Institutions: The future of the Transparency Register. With panellists representing the European Commission, the European Ombudsman, and academia, the debate centred on the ongoing work to revise the EU Transparency Register. Public interest in transparency is seen to be increasing across the EU, and so are expectations for openness and accountability. This is seemingly reinforced by the fact that, of the 1,700 responses received to the Commission consultation on a mandatory Transparency Register, more than 1,000 came from individuals. In addition, the consultation responses show a strong desire for a mandatory register covering all three main institutions. However, while there is room for improvement, the EU is seen as being ahead of most Member States in terms of transparency in the decision making process. This is an area in which the EU is seen as having a central role, and respondents to the consultation in particular appear to expect the EU to take the lead. In view of this, Transparency Register reform could well go some way towards reinforcing credibility and confidence in the decision-making process. Broadening the focus to cover all levels of the institutions and not just those actively lobbying could also prove useful, as lobbying is a two-way street. Perhaps one of the most topical issues raised during the debate related to the ‘revolving door’ and the need for greater clarity on the institutional background of those who go on to take prominent roles in industry. The fact that the Inter-Institutional Agreement is not legally binding was also raised. Nevertheless, the Commission is working towards finalising its work on a proposal on an Inter-Institutional Agreement for a mandatory register, and expects to be finished by the end of September, after which negotiations with the Parliament and the Council will begin.